With approximately 69 million children under the age of 18 in the United States, children comprise nearly one-quarter of the entire U.S. population. One of FEMA’s strategic priorities is to be survivor-centric in mission and program delivery by maximizing speed, efficiency, accessibility and ease of use of FEMA’s programs and services for individuals and communities. We have worked diligently to ensure that we meet this goal and effectively address the needs of all survivors, including children. The Children and Disasters webpage is comprised of resources to support the integration of children’s disaster-related needs into preparedness, planning, response and recovery efforts. These resources may be helpful for state, local, tribal and territorial governments, as well as stakeholders responsible for the temporary care of children in the aftermath of a disaster. RadResponder, a product of collaboration between FEMA, the Department of Energy's National Nuclear Security Administration, and the Environmental Protection Agency, is a free network that provides a flexible, efficient and integrated approach to the input and management of radiological data through daily environmental monitoring activities to all federal, state, local, tribal and territorial organizations. The program was originally conceived in 2011, shortly after the Fukushima Dai’ichi Nuclear Power Plant disaster. Five years later, RadResponder is now being used operationally across the country supporting a variety of organizations at all levels of government. The RadResponder Network is the national standard and whole community solution for the management of radiological data. FEMA’s Emergency Management Institute (EMI) hosts the Master Exercise Practitioner Program (MEPP). Participants in the program are assigned to an exercise planning team where they are challenged to: demonstrate their expertise at all levels of exercise design and conduct; apply best practices and lessons learned from their organizations and experience; and use the concepts from the MEPP curriculum for their exercise planning team assignments. The program is delivered in a series of three courses covering advanced exercise design, conduct, and evaluation practices in each phase of the Homeland Security Exercise and Evaluation Program (HSEEP). Each course is four days in length with breaks between each course to allow time to complete take-home assignments. Candidates must have three to five years of experience designing and conducting emergency management exercises consistent with the HSEEP doctrine and development of discussion-based and operations-based exercises. For a complete list of application requirements, course schedules, and instructions how to apply to this competitive program, please visit www.training.fema.gov/mepp. The application period is open until July 1, 2016. Please apply only once for the series of your choice. All classes are held at EMI in Emmitsburg, MD. Contact fema-emi-iemb@fema.dhs.gov for more information. 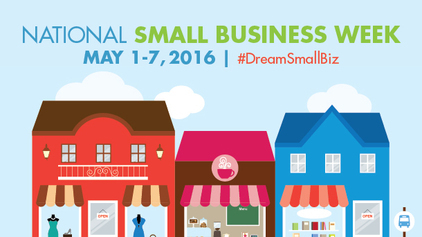 National Small Business Week is designed to recognize the contributions of America’s entrepreneurs and small business owners. According to the Small Business Administration (SBA) more than half of Americans either own or work for a small business, and they create about two out of every three new jobs in the United States each year. • Creating a detailed communication plan for your employees. For more information on preparing your business in case of disaster, visit the SBA website. On National Wildfire Community Preparedness Day, May 7, join your friends, family members, faith-based group or youth organization, and volunteer your time to improve your community’s ability to withstand and recover from a wildfire, which also may improve the safety of firefighters. • Move wood piles and propane tanks to at least 30 feet from your home or business. The Joplin Disaster Recovery Summit is hosting a two-day session on May 19-20 about the lessons learned through the recovery journeys of several southwestern Missouri communities affected by a devastating tornado in May 2011. The opening session, "Road to Resilience," will be available via webinar on Thursday, May 19 from 2:30 – 4:15 p.m. EDT/1:30 – 3:15 p.m. CDT. To register for the webinar, send an email to FEMARegion7info@fema.dhs.gov with your full name, organization, phone number, and email address. The cost to register for the two-day summit is $75 per person and registration is limited to 300 participants. Individuals requiring reasonable accommodations for either the two-day summit or the webinar should contact FEMARegion7info@fema.dhs.gov by May 5, 2016. FEMA released the refreshed National Incident Management System (NIMS) for a 30-day national engagement period. National engagement provides an opportunity for interested parties to comment on the draft NIMS, so that it reflects the collective expertise and experience of the entire community. This national engagement period will conclude at 5:00 pm EDT on May 9, 2016. To provide input, download the draft NIMS and feedback matrix from the link above and submit the completed feedback form to FEMA-NIMS@fema.dhs.gov. The National Advisory Council (NAC) will meet in-person from May 10-12, 2016 in San Antonio, Texas. The meeting will be open to the public. Members of the public are invited to provide public comments on Wednesday, May 11 from 2:50 p.m. to 3:10 p.m. CDT. Directions on how to submit public comments and meeting details can be found on the NAC webpage. For those planning to attend in-person, for additional information on facilities or services for individuals with disabilities or to request special assistance at the meeting, please contact the Office of the NAC by email at FEMA-NAC@fema.dhs.gov. More information on the NAC is available at www.fema.gov/national-advisory-council. On April 21, 2016, FEMA posted draft replacement language for the Public Assistance Program and Policy Guide on Public Assistance Program Minimum Standards to the Federal Register for public comment. When using Public Assistance funds to repair, replace or construct buildings located in hazard-prone areas, applicants would use, at a minimum, the hazard-resistant standards reflected or referenced in the International Building Code (IBC). Costs associated with meeting these standards would be eligible. The minimum standards will be used for all buildings in tornado, wind, seismic, and flood-prone areas identified in the IBC, regardless of the type of incident that caused the damage. As FEMA works to implement the new standard for its Public Assistance program, it is requesting input on the draft language from the public and emergency management community. The draft language is posted to the Federal Register, and will be available for comment until May 23, 2016. FEMA announced the Notice of Funding Opportunities (NOFO) for the FY 2016 Pre-Disaster Mitigation and Flood Mitigation Assistance grant programs. These two grant programs assist state, local, tribal and territorial governments in strengthening our nation's ability to reduce the potential cost of natural disasters to communities and their citizens. The NOFO for each program is posted on Grants.gov and contains the key program priorities and application requirements. Applications are due by 3:00 p.m. EDT on June 15, 2016. FEMA is updating its policy that guides how Agency officials interpret regulatory requirements in their review and approval of tribal mitigation plans. FEMA is seeking feedback from tribal governments regarding this updated policy, “Tribal Mitigation Plan Review Guide”. Tribal officials’ suggestions and comments will inform further development of the Tribal Mitigation Plan Review Guide. Tribal officials can submit comments on the Tribal Mitigation Plan Review Guide: Key Concepts document until July 8, 2016, either by e-mail to tribalconsultation@fema.dhs.gov or by mail to ATTN: Tyler Corson-Rikert, Federal Insurance and Mitigation Administration (FIMA), DHS/FEMA, 400 C Street SW, Suite 313, Washington, DC 20472-3020. Visit FEMA’s Tribal Affairs web page for more information on the tribal consultation period for this policy. The 18th Annual Emergency Management Higher Education Symposium, “Whole of Community-Talking about My Generation”, will be held June 6-9, 2016, in Emmitsburg, Maryland. The event brings together representatives of colleges and universities that have, or are planning to offer, a disaster management program. The registration deadline is May 13, 2016. FEMA’s Emergency Management Institute (EMI) Virtual Tabletop Exercise (VTTX) program will offer an earthquake scenario June 7, 8, and 9. The VTTX was designed to help communities specifically look at an earthquake in their community, using historical events and recovery actions. The VTTX occurs 12:00 p.m. – 4 p.m. EDT. To participate in a VTTX, send an email request to Doug Kahn at douglas.kahn@fema.dhs.gov or call 301-447-7645. Please send a courtesy copy email to the Integrated Emergency Management Branch at fema-emi-iemb@fema.dhs.gov or call 301-447-1381. The deadline for applying is May 13. Session content is the same each day and participants only need to attend one session. For additional information, visit EMI's Emergency Management Training, Virtual Tabletop Exercises and Course Schedule. FEMA’s Office of External Affairs provides this bulletin to highlight recent and upcoming program and policy activities and announcements. Feedback is welcome at fema-ea-bulletin@fema.dhs.gov. Previous editions are available at www.fema.gov/fema-bulletin. This bulletin is not intended to provide a comprehensive list of policies that are open for public comment, nor does it describe all of the instructions or requirements necessary to submit a comment. For a complete list of instructions and deadlines please click the hyperlinks included. FEMA does not endorse any non-government organizations, entities or services. The mission of the Office of External Affairs (OEA) is to engage, inform, and educate all of FEMA’s stakeholders in support of the Agency’s programs and initiatives to achieve its mission. OEA accomplishes its mission by coordinating and maintaining visibility of public and internal communications; advising FEMA program and support offices on decision-making regarding policies, plans, and actions that affect stakeholder, media, and Congressional audiences; and organizing outreach efforts targeted at principal stakeholders to include state, local, tribal, and territorial governments, the private sector, national organizations and associations, and the American public.